This is a 1998 book on current apologetic trends as foreshadowed by these two well-known writers. The authors are both from Asbury Theological Seminary, which shows through the critique especially in the chapter on Inerrancy. I think, however, that the book is a fair evaluation of the views of these two prolific writers. 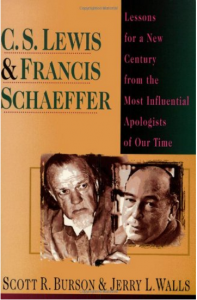 The value of the book is the purpose of the book, that is, to evaluate the successful apologetic techniques that Lewis and Schaeffer employed in their time. Despite our differences with some of their beliefs, they were masters at communicating to the culture in which they lived. Their writings still are quoted as much as any and their tactical approach to the modern pagans is still effectively used.